Members of the public and Sinn Féin activists gathered in Downpatrick in Denvir’s Hotel on Monday evening to launch the parties local election manifesto. 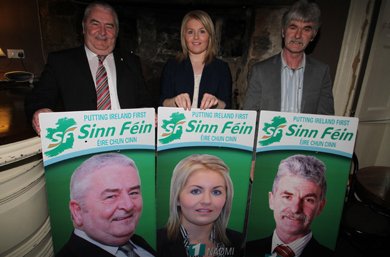 Sinn Féin local election candidates Eddie Hughes, Naomi Bailie and Eamonn Mac Con Midhe. The three candidates for those areas, Naomi Bailie, Éamonn McConvey and Eddie Hughes, explained some of the key points of the manifesto to the audience explaining the vision outlined in the document. “The people of this district have the right to earn a living and to provide for their families, the onus is on those who are elected on the 22 May to make sure that this is possible to do without having to move elsewhere. Rowallane Sinn Féin candidate Eddie Hughes also commented saying: “It was excellent to see such a vibrant and engaging crowd at the event and I have no doubt everyone in attendance will take away a sense of positivity about what we have outlined in our manifesto as I’m sure the public will do also. 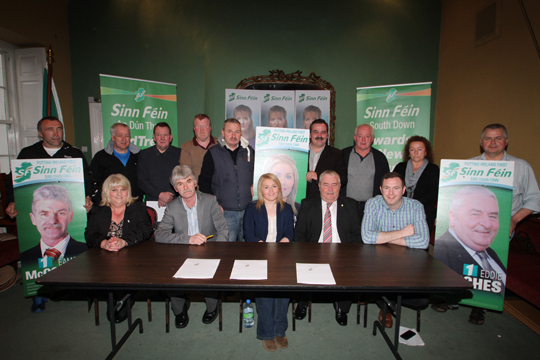 The local Down District Sinn Féin candidates Eamonn Mac Con Midhe, Naomi Balie and Edddie Hughes with party officials and supporters pictured in Denvir’s Hotel at the launch of their election manifesto.